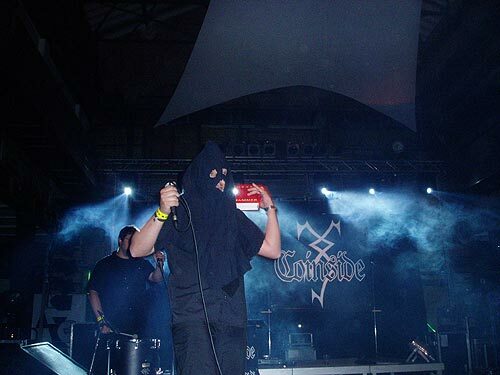 13 – 16 May 2005, Leipzig (Germany), various locations. Friday was a rather tranquil day on a musical level. We went to the central Agra location and filled our bags and emptied our wallets in the shopping hall (found a nice pile of cd’s for 2 euro each amongst others). We also strolled through the Heidnisches Dorf (the pagan village) and visited the medieval market and Spielleute at the Moritzbastei. Then we headed for Werk II to see the first real bands. We saw a part of the show of Angelzoom. I did not know them yet, but it was quite nice, good female vocals, electronics and strings, reminded me a bit of the ballads of L’ame Immortelle. 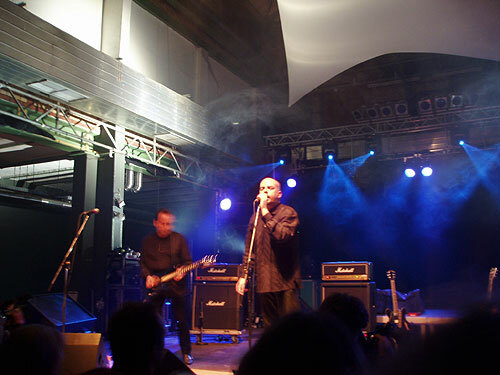 Next on stage was Ikon, the gothic rock veterans. They did a decent show, with some clear highlights (‘Ghost in my head’, ‘Fall Apart, ‘Black Roses’), but also some songs that were less convincing, partly because Ikon’s vocals aren’t always powerful enough. Saturday we spent all day in the new (too small) venue Anker, which seems to have replaced Haus Leipzig. First band lined up were the Italians of Inner Glory, known for the ‘War is forever’ single and “Remains of a dream” cd on Hau Ruck!. 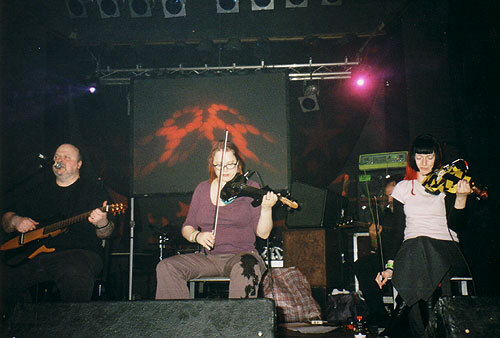 Though they played their decadent neofolk in an energetic manner, they couldn’t totally convince. The songs were rather chaotic and I was not really fond of the vocals. Some musicans were really good though, especially the cello and bass player, as they demonstrated during the improvisation while the singer replaced a strong on his guitar. Darkwood was really wonderful. Especially the singing by Henryk Vogel was very beautiful, and most of the music was played live in a professional manner, with guitar, bass, drums, accordion. Only the additional female singer was a bit too nervous, but it was still a nice extra touch. In My Rosary did not really fit in with the rest of the program, but they did a decent show with their sound somewhere between guitar and electronic wave, with some folky elements. They showed once more to have a lot of fine melodic, emotional songs. Sonne Hagal also did a solid concert, though I have seen them better before. Especially the vocals could be more dynamic. 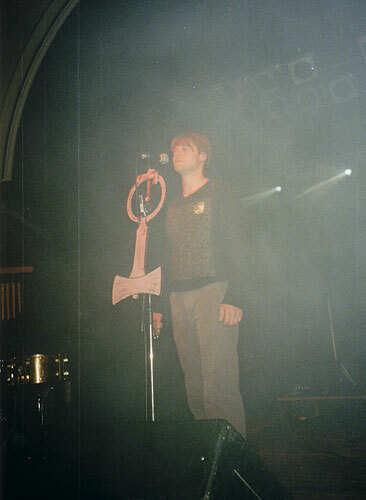 Forseti’s Andreas Ritter, who sang one song, gave the good example. It’s a bit of a pity that an important rhythmic part of their music came from cd. Still there were some nice moments, like ‘Odin’, ‘Sonnenwende’ and ‘The Runes Are Still Alive’. They were followed by the band most people in “Anker” had come for, Sol Invictus. And they were not disappointed. 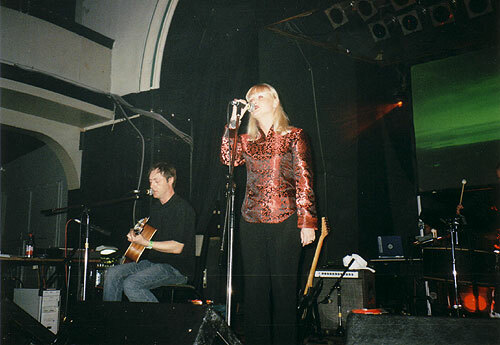 Tony Wakeford (guitar, vocals) was assisted by two violin players and Karl Blake on bass. They sounded more robust and rough and less subtle than on previous occasions I saw them. 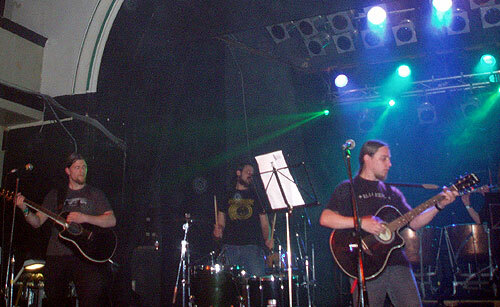 Numerous Sol Invictus classics were played, including many really old songs, like material from “Against the modern world”. Final act of the night was a legendary one: ACTUS. 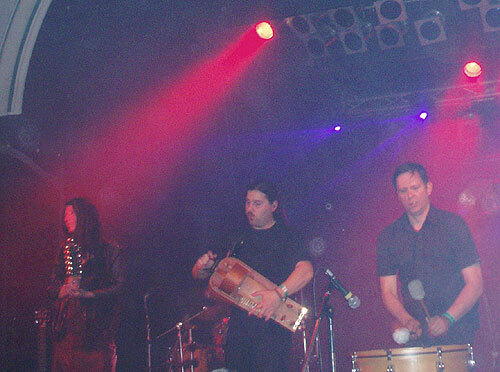 They performed for the first time in 10 years, to promote their new album “Mandala”. Much new material was played, long electronic, orchestral soundscapes, sometimes epic, sometimes psychedelic sounding, with martial chants in Hungarian. The sound was loud and rather distorted. 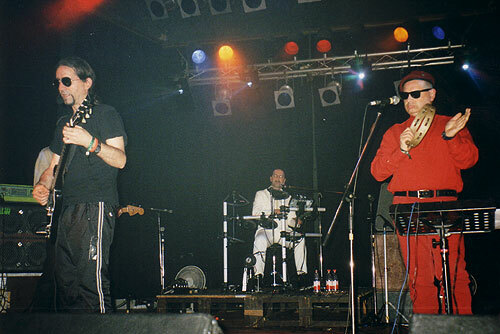 I found it a pity that they did not have more instruments on stage, most of the sound was created electronically. The female singer was nice for the visual aspect, but her musical contribution was not that big. ACTUS also used nice background animations. Towards the end I was happy to hear some old folky classics, like ‘Botschaft from Hyperbora’. On Sunday we started relaxed with some seated concerts in the Schauspielhaus. 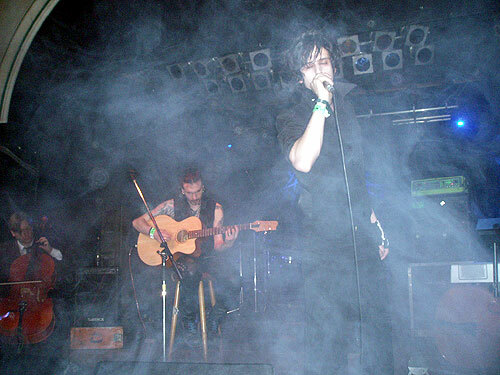 Trobar de Morte was a new name for me, but this Spanish group left a good impression with a medieval/Celtic sound and a fantasy atmosphere. Next was Love is Colder than Death, as always very convincing with wonderful vocals and nice tribal drumming. I had to leave preliminary though, to be in time at UT Connewitz, an old cinema where a special dark ambient night around the Loki Foundation label took place. Though I was rather early, all seats were taken and I had to sit on the floor. I was lucky though, because many people could not get in at all. 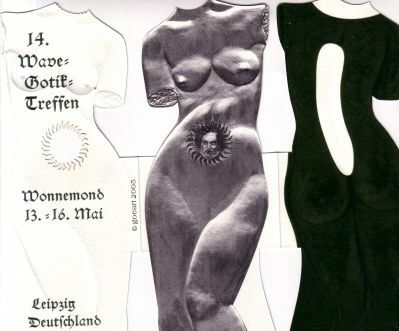 The UT Connewitz was a wonderful venue, with a bare concrete structure which looked very industrial, and a strange Greek temple on the wall where the films were projected. First was Herbst9, and it sounded fantastic. Very moving sounds, as monumental as gothic cathedrals. The music really brought me in a trancelike state. Schloss Tegal was less accessible, sounding like a big vacuum cleaner with deep drones, low noises and radio frequencies. A funny moment happened halfway when the audience did not hear any music anymore, while Schloss Tegal kept manipulating his equipment energetically with his headphones on. Someone had to climb the stage to tell him to put a plug back in. It took a while before Inade really got into it, but then they sounded really powerful, in what seemed to be one long track. They were also clearly improvising and adding elements live. They used for instance a bass and a didgeridoo, added some vocals and manipulated a sound device by moving their hands above it. The magic of Inade was over far too quickly. Day four started heavy and electronic at Werk II with Coinside, a dark electro project related to Wappenbund. 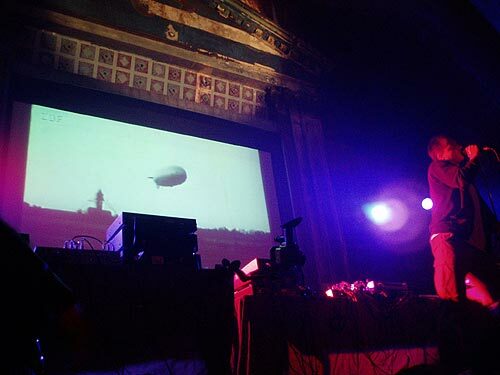 A skipping cd-player created problems at the beginning, but after this was fixed Coinside played their bombastic songs, including the hit ‘Hexenhammer’. A bit simplistic, but entertaining for half an hour and a good manner to wake up. Then things slowed down at the Schauspielhaus, where we watched D’Arcadia. 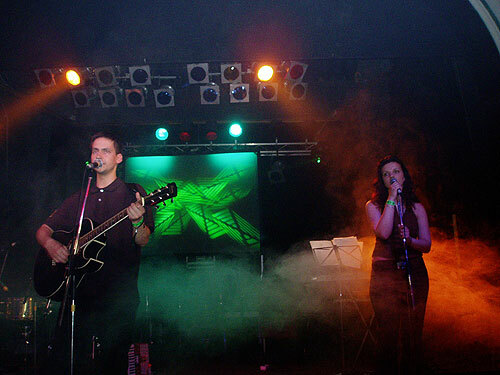 This band with two female singers makes a mixture of medieval and gothic music. 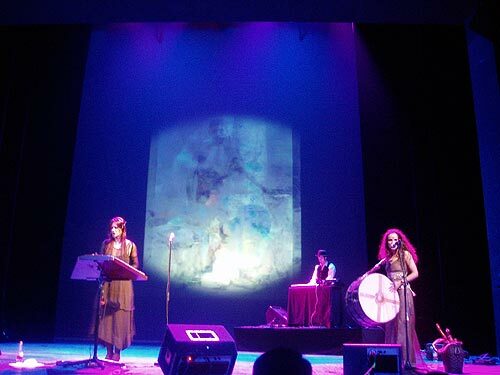 Their performance was not bad (though a bit synthetic), but could not keep my attention during the complete concert. 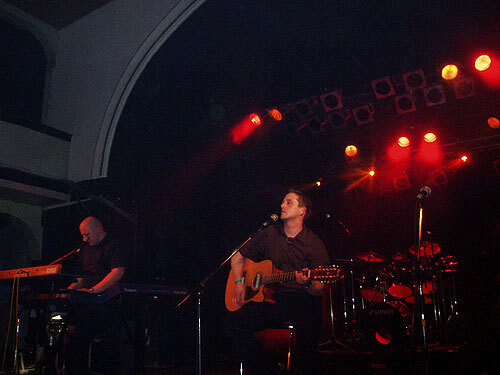 The rest of the day we spent at club Anker again, to attend some more neofolk concerts. Graumahd from Austria, who only have a single out on Hau Ruck!, was a pleasant surprise. Though far from faultless (it was only their second live appearance), I enjoyed their dynamic concert with six people on stage. Hekate was a bit of a mixed affair for me. Though I’ve always appreciated them as an entertaining live band, I’m not completely happy with some of the recent material they played, which seems to be smoother and poppier than before. They also employed a new female singer, who tried really hard, but did not really fit in with the rest of the band as far as I’m concerned. Hekate did use some nice theatrical effects, like throwing roses in the audience, and some of the songs were really powerful, like ?Moritori e salutant?. Voxus Imp is an older project which has been revived again, with recent releases of older material. 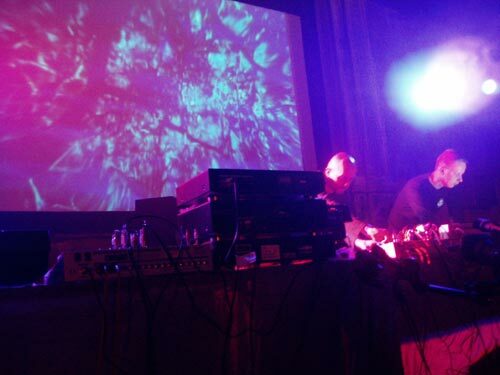 The two musicians, who are also involved in Darkwood, treated us to a hypnotizing, ritual sound. Mysterious electronic soundscapes, staccato percussion and archaic chants created an interesting whole, which was perhaps not accessible enough for everyone, but which I found quite fascinating. More melodic sounds came from Novalis, the German act which seems to gain in popularity. Certainly no pure neofolk, but just pleasant romantic songs and a solid performance. A nice addition was the violin player, who made the synthetic sound much more lively. Though I’ve been to Leipzig various times, I’m still fascinated by this dynamic city with its exciting mixture of tradition and progress, of decay and renewal. As always I reserved some time to wander through the city. Some new things I ‘discovered’ in the city were the interesting museum “in der Runden Ecke” in the former Stasi bunker and the nice walking route along the canal in the old industrial area of Plagwitz. 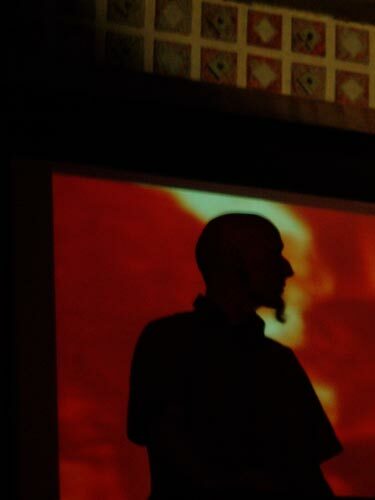 In conclusion the dark ambient night with Herbst9, Schloss Tegal, Inade and Predominance was the highlight for me. 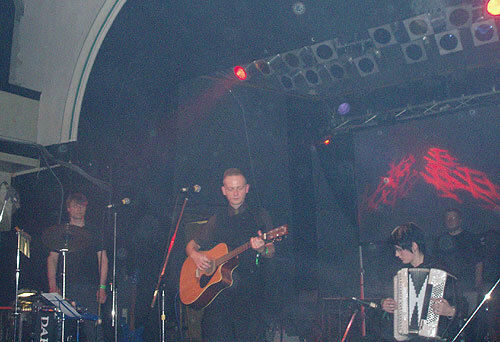 The neofolk act that I liked best was Darkwood. Special acts that I hadn’t seen before were ACTUS, Voxus Imp and Ain Soph. Among the new acts that I enjoyed were Trobar de Morte and Graumahd.